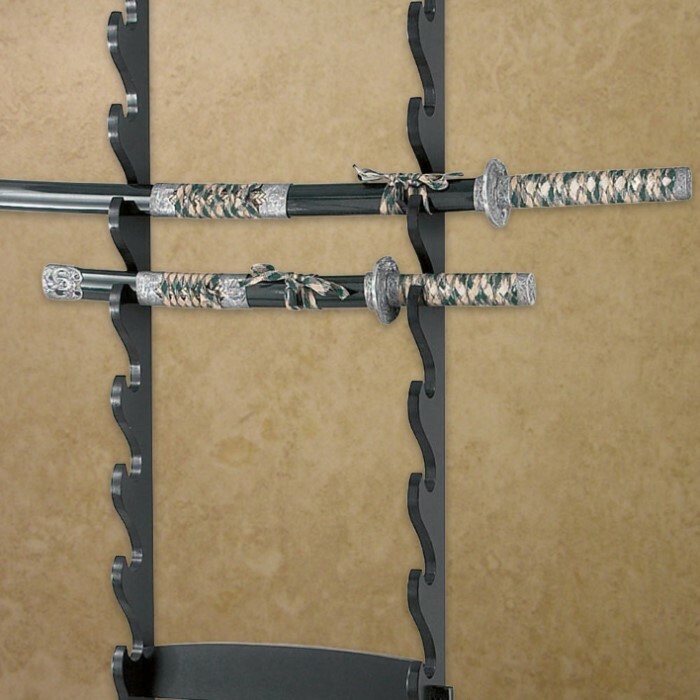 Samurai sword stands are the ultimate display. Each upright stand is solid using wood construction accented with cast resin samurai medallion. 39 in. tall. I didn't expect it to be so well made. It looks GREAT! Well worth the cost. It comes with a single point hangar at the top. If you're going to hang it on the wall you should drill a hole through the bottom cross member and put a screw there too. One screw won't support the hangar and 8 swords. good stand, came with a sword I ordered. a bit smaller than I expected but gets the job done! I enjoy seeing it on my wall. comes with all screws and even a nail to hang it. this rack was a very good item and I'd recommend it to anyone.It was easy to assemble and very easy to hang and the price was fair for the item,Thanks BudK. Great item for the price. Gave to my son for Christmas and he loved it. BudK has the best deals on the internet. Its cheap but it works and it seems to be holding together just fine with three swords and five bb guns in it right now. Cant beat it for the money and cheaper than making it yourself. Would recommend adding felt linings to the rack slots. This is a sweet little wall stand. The wood is real and varnished, instead of the IKEA-type kits others offer. Thanks, BudK! I drilled four holes, one in each corner, and used anchors to mount this. The stand is decent. Not bad at all. Comes with anchor, mounting hardware, and choice of stud or screw for the anchor. I like my shelving solid and worry free. If you want it balanced you will have to shift your swords around for weight distribution. I say buy it, if you do not like it...hack it up with your sword. This thing is made of cardboard, the drilled holes are misaligned and easily stripped, there is no central support (either vertical or horizontal) to prevent the weak material from twisting under the weight of a full stock of swords resulting in the screws being pulled through the board and the display in general is too small for 8 swords (the width, the diameter of the hooks, etc). Trust me, I now have to somehow reattach an ivory dragon head to a katana after this thing decided it didn't like hanging on the wall like a good little display (the mount was properly anchored, in fact it's still in the wall--it ripped right through the cardboard). 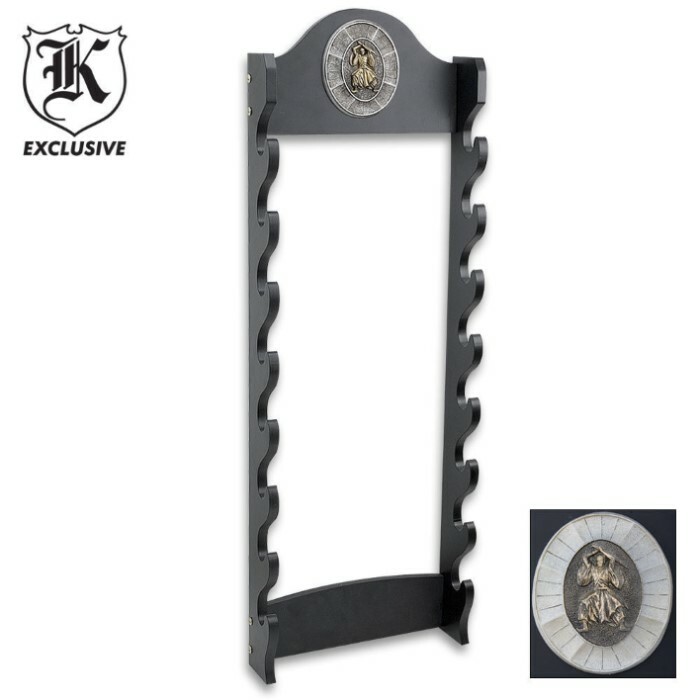 The only redeeming quality is the fact that you can rip off the top section and mount it on your wall as a display piece all its own, though you may want to carve it up a bit due to its odd shape. Overpriced by roughly 600%. Luckily, the rest of my order which consisted of items from reputable manufacturers more than made up for this poor purchase.